This is my own version of Lady Gaga's "Telephone" wherein I recorded the audio last May 2010 and made some video clips to create this whole thing. Along the way, I had to stop because I got lazy-uninspired and there were a lot of events that took place between June-September 2010, making me forget about the whole thing. 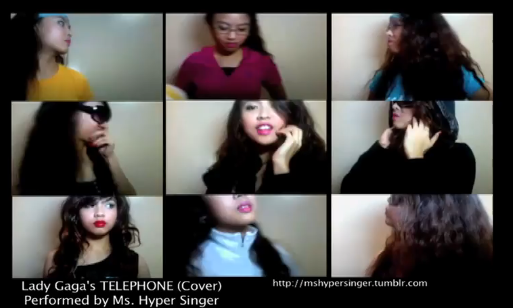 Since I got inspired once again due to my Orlando Bloom tandem music video and my GLEE parody with my friend, I decided to continue my TELEPHONE project and here it is. Thanks to my cousins because I got motivated to push myself in this vid for the sake of entertaining them. :) Hugs! P.S. This is what I was doing before I saw the bloggers at MOA. Yep. The reason why I was a total zombie. Haha! I slept at 4:30 a.m. and woke up at around 5.30 or 6:00 am. HAHA! I promise to visit you guys back soon. This is a scheduled post because my cousins are here and I find it hard to update all the time. I promise to get back to you guys asap! Hugs hugs! 61 Travelers with Comments. Click to comment! Hyper na hyper! I labet!! Encore!! Encore!!! Charice!!!! I love how I get to see this first on yt! I really admire you. Please have the time for us your other gleeks :D I promise not to send you to that crack house no more, I'll be a good girl. haha. this is very very very nice! may i know what software you used on this one? Damn, this is epic! I can just imagine the number of hours you shot this, and then put this together... This is sooo good I almost want to make a spoof hahaha. Nimmy - Aww thank you!!! Hugs! Jepoy - DUET NA TAYO! Em - You always get to see it first... garrr hahaha! LEA, i think we know what my next vid's about ! ;P I also wanna see u in your videos! I only hear you but I don't see u. :( Hugs Ms. Lea :P I'll b your first supporter! MWAH! oliver- aww thank u idol :) i used final cut :D yiii gagawa na yan! hehe! michael - awww haha! hmmm, i wanna hear you sing. i bet you're much better than me haha! glen - dude! aww thanks! actually, this is what i was doing before i saw u guys at MOA. hahahaha! yep... the reason why i was all sabog. haha! oh wowww gusto ko makita spoof mo! teka, kinakabahan ako. baka puro *roll eyes* nnaman! haha! ate rose- ate!!! aww thank u! i hope to do a collab with u soon ;D u have a great voice! I've been listening to this ALL DAY! I'm so addicted I had to download it and transfer it to my fone. Galing naman ng version mo. Liked it! ang galing naman, ang dami mong takes ah, with difrent styles! ang hirap siguro gawin niyan..
grabe.. Now i heard you sing..
ang galing! CLap clap clap! Great video. Nice editing. Good performance. If I can just make one constructive criticism (I used to edit videos/mtv professionally, also did video playbacks for concerts and stuff), HEAD ROOM. If you can fix the framing of your videos so that your head doesn't get cut-off, you would have an even better mtv. But great work nonetheless! BRAVO! kumagcow - fun fun fun! hahaha! midnight driver - thank u ! (from charice) hehehehehe! jag - aww thank u jag... grabe parang music teacher lang a. hahaha okay mali--judge pala! hahahah! pero ang galeng...dami mong alam :D thank you! mega super duper great voice you had..!!!!!!! Yun oh! naks naman... hirap naman gumawa ng maraming look para sa kantang yan... angtyaga mo! Idol! ahahahahhahaha... magaling! magaling! Hi Cutie! Super naaaliw ako sa galing mo gumawa ng music video. As in, i'm like WOW. Hahahaha! :) I'm entranced by your charm. Kaaliw to the nth power. Oh my, girl! You are all funny, entertaining and cute! Heheh! I don't know what to say! Nice one! Getting the Glee fever huh. bakit ba naun ko lang to napanood!! hahaha, it was so fun to watch.. love it! Wow, ang galing niyo po... Nice video. I like it! You are really amazing and you have a talent. :) nice video! huwaw!!!!!!! ang galing!!!!! impressed much ako! galing ah!!! i labet na riN!!!!! ^^ MORE MORE MORE!!!!!!! I LOVED THAT!!! THAT'S SO COOL! !